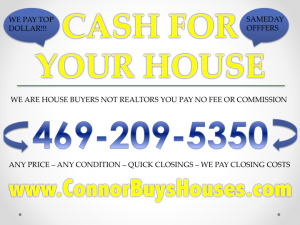 SELL MY HOUSE FAST MANSFIELD "WE BUY MANSFIELD HOUSES "
Connor Buys Houses In All The Metroplex Areas. We are a local family owned business and are looking to buy houses in the Masnfield area. Do you need to sell your house fast Masnfield,TX? 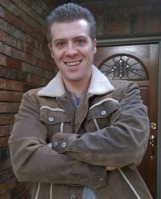 Connor Buys houses in Mansfield. We know the local area well and will provide you with a comprehensive market analysis. We can pay cash and are able to close very quickly or when it is most convenient for you. Connor Buys Houses would like to make you a qucik and fair all-cash offer. We can even GUARANTEE that offer and can have a check in your hand in as little as 7 days. Just give us a call at 469-209-5350 to get your quick cash offer over the phone today… or take a second to fill out the simple form below. You may be thinking can I sell my house fast Mansfield??? You can sell your Mansfield house Fast for Cash with Connor Buys Houses. We can and have the ability to close quickly and even more importantly, quickly relieve stress. Selling a Mansfiled house shouldn’t have to be difficult. Connor Buys Houses makes it very easy and convenient for you. We will quickly assess your property and situation and make an all cash offer fast!!! There are a number of different situations where we can help, including… foreclosure, divorce, relocation, inheriting a property, owning a vacant property, backed payments, owing liens, downsizing, repairs needed that you cannot afford to pay for, fire damaged, horrible tenants, and anything else you might be impacted by. The bottomline is, if you have a property and have to sell it… call us today and we can make you a quick all cash offer…. CALL NOW… 469-209-5350. We work extremely hard to constantly meet the individual needs of each of our clients we work with as quickly and efficiently as possible, and always work at finding a solution that works for you and works for us as well is what we do best! What’s the chance that you have tried to sell your house but are running into consistent roadblocks. I bet that you even tried calling a real estate agent. Most of the time selling a house the traditional way with a realtor is not going to be the best for everyone. As you aware of, there is a good chacne there will be lots of pitfalls when selling a house utilizing a real estate agent, for example: cleaning up and making repairs before showings, finding trust worthy realtors who can deliver, signing binding contracts, large amounts of paperwork you need to sign, and the constant cycle of paperwork back and forth from buyer –> to agent –> to you… and back. As well as the never ending hassle of the continuous showings. A large number of people we work with have made an effort to sell their house on their own, but they end up not attracting the right buyers. The buyers they attract end up being very picky and almost always need bank financing. Even now the banks are extremely picky with the buyers today and a large a majority of them do not qualify. It can quickly become difficult, time-consuming and overly frustrating. We solve that problems because we buy houses in Mansfield with CASH…and not with bank financing. One of the single biggest issues with trying to sell your Mansfield house fast with a realtor, or by trying to sell it yourself is often times retail buyers will tie up your house house for multiple weeks and pull out from the deal at the very last second for any reason… or they may have their bank loan fall through at the lsat moment. All of this can and will add stress, many months to the process, many dollars lost out of pocket, and in after paying the realtor fees, you may or may not have profited anymore then you would have by calling Connor Buys Houses right to start. 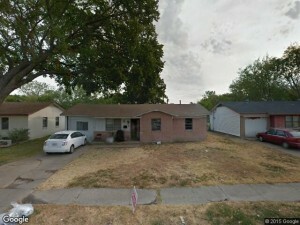 We pay fast cash for Mansfield, TX homes! No need for real estate agents and their over the top commissions for minimal work. Furthermore…many ask us can I sell my house fast Mansfield??? No matter the condition of your house – your situation – or timeframe… Our number one goal is to act fast and make your life easier by helping you get out from under that property problem that’s stressing you out every night… while still offering and providing and paying a fast, fair, all cash offer for your house. Want To Sell Your Mansfield House or Investment Property? Do you want to sell a home, but have little or zero equity? If you cannot afford to or simply don’t want to pay over the top agent fees out of your own pocket to list a home that is upside-down, don’t stress out.. we can still help you. We can and will market your home for you using the most recent methods, guaranteed to put your home in front of thousands of Buyers to see within 24 hours… and it’s a service we offer free to you! We sincerely have a solution to every situation. Connor Buys Houses has multiple offerings to choose from and we’re pretty sure you’ll be happy working togther with us. We would be grateful for the opportunity to work with you. Is there a Reason for Moving? Moving to assisted living facility? Outgrowing and Need more space? Would you like to Avoid Repairs and/or Updates? The sale of your Mansfield home can easily help you achieve this. We do ALL the work for you and we will even clean up after you. Take what you want and need and leave the rest behind for us to take care of. A/C units won’t stay on? We pay cash for homes in Mansfield and we can close in as little as 7 days from the date you contact us and we see the property in most cases or when it’s convenient for you contingent on certain variables like clean title etc. Foreclosure Click here to find out more about the Dallas market provided by Zillow. For today’s Dallas real estate overview provided by Trulia, click here. 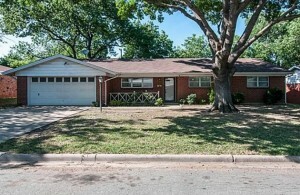 Click here to find out more about the Fort Worth market provided by Zillow. For today’s Fort Worth real estate overview provided by Trulia, click here. Fort Worth 76102,76103, 76104, 76105, 76106, 76107, 76109, 76110, 76111, 76112, 76114 ,76115 ,76116 ,76118, 76119, 76120,76123, 76127, 76129, 76131, 76132, 76133, 76134, 76135, 76137, 76140, 76148, 76155, 76164, 76177, 76179. If you need to sell your house fast Mansfield, Texas, reach out and connect with us… You’ve got nothing to lose !!! We buy houses in Mansfield and work often locally with people in your community everyday when they are up at night sleepless thinking can I sell my house fast Mansfield. We are here to help if we can. You can reach us by calling or texting us at 469-209-5350. Another very easy and simple way to get your information to us about your property is to fill in the QUICK ONLINE RESPONSE FORM form by clicking this link. It takes just a second and we will be in touch with you shortly to discuss your situation. I hope we cleared up a few questions you had especially the can I sell my house fast Mansfield question. 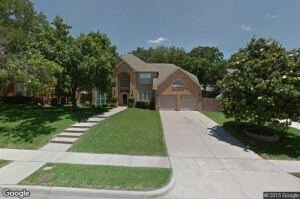 We buy Dallas houses every week and our known for paying TOP DOLLAR and closing quickly. Once again you can reach us at 469-209-5350 or by taking a moment right now to fill in the online QUICK REPSPONSE FORM.